New Delhi: After initial hesitation, the government has sent signals that it’s considering changes to controversial foreign direct investment (FDI) norms, which led to some private sector banks, including ICICI Bank Ltd and HDFC Bank Ltd, being classified as foreign-owned institutions. 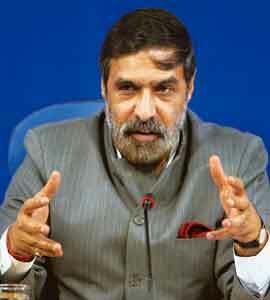 “There have been some issues that the Reserve Bank of India (RBI) has raised," commerce and industry minister Anand Sharma said at the annual economic editors’ conference in New Delhi on Wednesday. “Any clarification if required, our officials are in a position to do so (clarify)." The new FDI guidelines issued in February this year require both control and ownership to be with Indians for an entity to be deemed Indian-owned. In the event that either ownership, which means a stake in excess of 50%, or management control is with an overseas entity, it will be considered foreign-owned. RBI has pointed out that the new norms will create a new set of banks which are “owned by foreigners but controlled by Indians", thus creating a regulatory challenge for the central bank. RBI also named seven private sector banks, including ICICI Bank and HDFC Bank, the two biggest, which would be classified as foreign-owned. ICICI Bank approached the department of industrial policy and promotion (DIPP), seeking a clarification on the issue. “One limited area (in foreign investment policy) is under discussion—that is banking sector. We are holding discussion with RBI," said Ajay Shankar, secretary in DIPP, who was present at the conference. Finance minister Pranab Mukherjee said at the same conference on Tuesday that the government would issue clarifications, if they are required, on the norms, and added that consultations were under way on the issue. Commerce minister Sharma had said in September that the new FDI policy is “so far working well", implicitly brushing aside suggestions that banks should be exempt from the new rules. “If there are any issues, the inter-ministerial group can look into it. But at this stage it is too early to make any judgmental evaluation of the policy," Sharma had told Mint in Hyderabad. On 27 October, in reply to a question at a Mumbai press conference after the second quarter monetary policy review, RBI governor D. Subbarao said, “The issue has not been completely and finally resolved." The new guidelines also created scope for indirect foreign investment in prohibited sectors such as multi-brand retail, where the government does not allow FDI at present, with the foreign partner holding a minority stake in a joint venture with an Indian company. Asked whether the government would plug this loophole in the FDI policy, DIPP’s Shankar said FDI in multi-brand retail will not be allowed as “we are not yet ready for it". The central bank had pointed out that the new guidelines could lead to the formation of “shell" companies, whose sole intention would be to make downstream investment in sectors with FDI restrictions or with sectoral investment caps. “If banking sector has to be exempted from the new FDI policy guidelines, it will need the cabinet approval," said a senior DIPP official who spoke on condition of anonymity. To plug the loophole in the policy that may lead to indirect foreign investment in multibrand retail, “issuing a clarification may be sufficient", he said. In the first six months of the current fiscal, India received FDI inflows of $15.3 billion (Rs72,063 crore). Cumulative FDI inflows have crossed $120 billion. Last year, India received FDI of $35 billion. “The new FDI guidelines should exclude the banking sector as unlike other sectors which are regulated by the Companies Act, the banking sector is governed by Banking Regulation Act. The issue regarding possibility of indirect investments into prohibited sectors like multi-brand retail also needs to be clarified once (and) for all without leaving things for various interpretations," said Ganesh Raj, tax partner, policy advisory group, Ernst and Young. Sanjiv Shankaran contributed to this story.